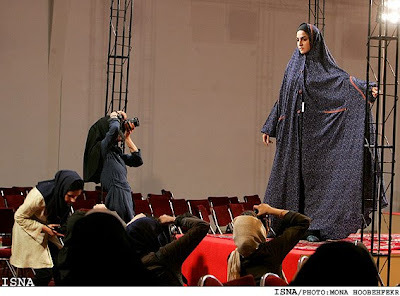 The Iranian Regime held its third annual Festival of Women of My Land conference complete with a fashion show highlighting this year’s bold new look. A group of ambassadors of the Islamic countries to Iran and their families paid a visit to the 3rd Festival of Women of My Land currently underway at the Institute for the Intellectual Development of Children and Young Adults on Saturday. Accompanied by the Iranian Foreign Ministry Officials, the group visited the works of designers of their own country as well as other Muslim countries’ dress designs. 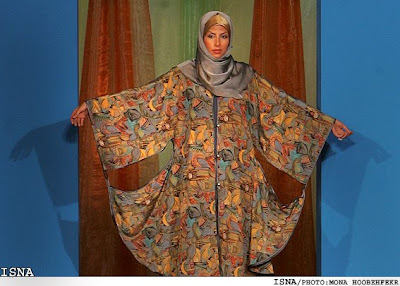 A total number of 33 Islamic countries participated in the festival presenting new Islamic designs for women dress. Did I mention black is in? 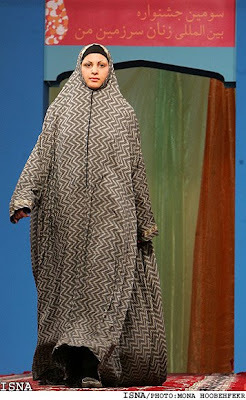 This design doubles as a blanket. …If you fall off a cliff you just open your arms and glide to safety.